All our football betting tips are completely free so get involved! Our football accumulator tips and our BTTS tips both have a fantastic profit record. And not to mention our famous BTTS and win tips which have produced some huge winning bets recently! Introducing our latest offering – Over 2.5 Goals Tips. Football Bet Profit’s football accumulator tips are updated every day with a new accumulator alongside our daily both teams to score tips! Our BTTS and win bets and over 2.5 goals tips will be updated at least once a week! Football Bet Profit’s full list of free bets that we’ve compiled from across the web. We compare the free bet amounts, terms and conditions, odds and general usability of each site. We have many types of free bet offers for you including accumulator free bets, matched free bets, enhanced odds and price boosts. Each type of free bet pays differently, so make sure you understand what kind of offer works best for you. Each site is rated out of 5 based on our own experience with using them. Make sure you’re signed up to them all for the maximum chance of making profit! If you’re over in the States make sure you check out the best USA online sportsbooks listed at WonderPunter. Making profit from Football Betting doesn’t have to be complicated! Everyone loves a bet on the football and everyone thinks they can make a profit from it. The fact is, most people don’t. People over complicate their bets or try to get rich quick, but we know better than that. We provide regular, well researched, tips that have a proven success record. We don’t waste time betting on stupid fixtures that we know nothing about, but whenever there’s something worth betting on we will post accumulator tips and both teams to score tips, throughout the football season these tips will be updated everyday. We’ll also be updating our BTTS and win tips regularly with some great bets at huge odds! If you’re a fan of our betting tips you can sign up to our mailing list below to get them all delivered to your inbox for just a one time fee of £10! More information about our email subscriptions can be found here. Making profit from betting is not just as simple as following the right tips. One big mistake that many make is finding a site they like and sticking to it for every bet without thought. You probably do this yourself because it’s quick and easy. Stop this! Spending the time to find the best site for each bet can be the difference between making profit and losing money. Take a look at our list of the best sites for football betting where we explain the best site to use for each type of bet. It’s worth taking time to read through our football betting guides to see how we make our predictions and place our bets. The great thing about using multiple sites for your football bets is that you can claim plenty of free bets! 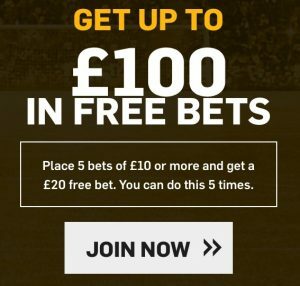 All sites offer new customers a free bet for signing up and this is a great way to get a head start on making profit. We’ve compared the sign up free bets from 14 of the top betting sites so make sure you’ve claimed all of yours! You can read more about Football Bet Profit and if you need any help then you can get in contact with us on Twitter – we’re always happy to help. Otherwise head on over to our football betting tips and get involved today! The very best sites for free bets and bonuses as well as general use. This site is the best,despite the staggers recently i still recommend it above others..when i mean the best, i mean the best! This site is genuinely great. They actually try to help you make money which you don't get very often!